Care – When, What Kind, and Where? One of the most common questions I am asked is when should care begin, closely followed by what kind of care and where. The answers are not as clear as the milestones or benchmarks when raising our children. Those tend to be age related and as our parents are demonstrating – age really is just a number and not necessarily reflective of wants or needs! Our parents’ uniqueness as individuals has had a lifetime to grow, develop, and sometimes even become rigid or cast in stone. There are no age-related growth and development charts for easy reference. You can, however, visualize a pie chart with three equal pieces labeled Limitations and Medical Concerns, Quality of Life and Social Needs, and Financial Considerations. Begin filling theses pieces in, knowing there will be a time when the current arrangements will no longer work. Functional limitations and medical concerns may include activities related to daily living such as nutrition, hygiene, dressing, activity (addressing literally how one gets around), medication, and chronic disease management. Instrumental activities of daily living include how one interacts with their environment, such as preparing meals, doing laundry and housework, using the telephone, shopping, and driving. Medical concerns like anti-coagulant therapy, memory impairment, visual or hearing limitations have a direct impact on daily living functions and need to be included here. Try not to wait until the existing arrangement is not working! Quality of life and social needs are not as easily measured. These are the things that make us unique as individuals and one could argue – the most important consideration. My father is a North Dakota native; farming is in his DNA. His connection to nature and the land is amazing and unfailing. Those are his guideposts for living. He has made this piece of the pie very clear for us; he will not be leaving his beloved land and people. For us, the where has been answered. The when and what kind of care remains episodic, rather like a moving target, affording us plenty of practice in hope of getting it right. Financial considerations are the black and white reality, though there is room for some creativity. What kind of care and where balanced with quality of life requires ongoing learning and evaluation of the pie chart. For many families this piece may not be clear. Those of us raised in the 50s and 60s learned early on what our business was and what was not and we learned it well! Having a clear financial reading provides clarity and opens discussion if there is going to be any creativity. Assets, debt, and fixed incomes can all be successfully managed (no matter the level) once you have a clear picture. Learning when care is needed, what kind of care and where, is as individual and unique as your parents are. There is no one size fits all solution. Continued evaluation and understanding of the pie chart will increase your chances of hitting the moving target! Making informed decisions with or for your loved one requires due diligence and heart. 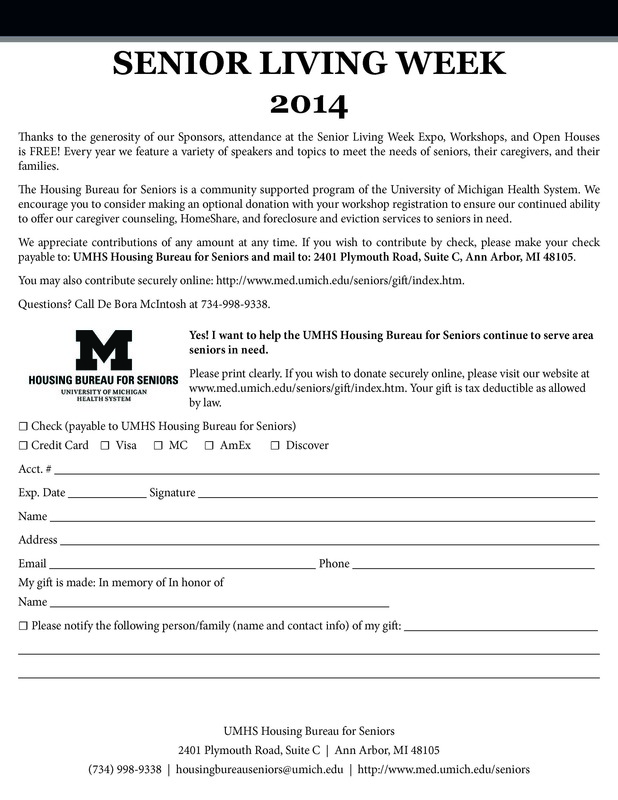 Senior Living Week, presented by UM Housing Bureau for Seniors, is an opportunity to begin or continue understanding when care is needed, what kind of care, and of course where. Start filling in the pie chart at Senior Living Week 2014! Beginning Friday, May 2nd and continuing through Saturday May 10th, there are workshops, open houses, free health screenings, and an Expo at the Ann Arbor Marriott Ypsilanti at Eagle Crest, with something for everyone. There is free parking and free admission, so mark your calendar! Learn more about how Certified Geriatric Care Managers can perform an assessment to help determine the needs of an elder loved one and find the right resources. Certified Managers may also conduct a review of financial, legal and medical issues and refer your family to appropriate specialists. Learn more about counseling, coping with illness, grief and loss, and planning for the future. Learn what Medicare, Medicaid and private insurance will and will not cover. 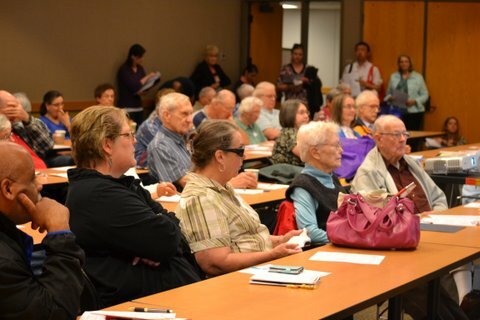 Also, gather firsthand information from local resources to help you make informed decisions. Just as important, learn why Ann Arbor is one of the leading retirement cities, our weather notwithstanding! Please join this collaborative effort to share resources and information and start planning today! It’s time for Senior Living Week 2014 and this year there is more information and resources to offer our community than ever before! Thanks largely to the due diligence of the Housing Bureau for Seniors, this year’s offerings are a reflection of community feedback through the years about what our residents and families need. Care Response Home Care began participating in 2006 and can speak to the progressive event changes keeping pace with community needs. We are honored to be this year’s Event Sponsor, knowing there is something for everyone and admission is free! Aging in Ann Arbor continues to make headlines. From the 2008 AARP ranking of the healthiest U.S. City for retirement, to the 2012 report released by the Milken Institute citing Ann Arbor among a number of cities for the community support of their aging population. Encouraging factors include public transportation, strong health care systems, wellness, and living arrangements. Also mentioned were financial well-being, employment, community engagement, multiple universities, education, and overall learning environment. It would appear the country is catching up with what we have always known! Planning for retirement can be overwhelming, so gathering information from multiple sources is a great place to start. There are several considerations including financial, lifestyle preferences, and ultimately the health and well-being of you or your loved one. Using this ‘three legged stool’ approach, you begin to paint a unique picture for planning. My experience helping clients and families determine their unique picture usually begins with lifestyle preferences which makes sense as we know where and how we want to live. Having a financial and healthcare overview is often not as clear but there are professionals who can help you navigate these sometimes complex pathways. As a certified Geriatric Care Manager, I have a duty and an obligation to those I serve to stay current with the new retirement frontier. The good news is we have many options here in Ann Arbor; the perhaps less than good news is there is an overwhelming amount of particulars to sift through to arrive at an informed decision! 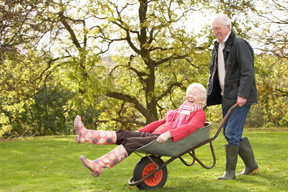 Elder law attorneys, estate planning specialists, assisted living facilities, respite care, home medical equipment companies, organization and downsizing experts, and geriatric nursing services are a few of the resources available during Senior Living Week. If your preference is socializing and an array of activity choices, you may want to learn more about retirement communities and downsizing. 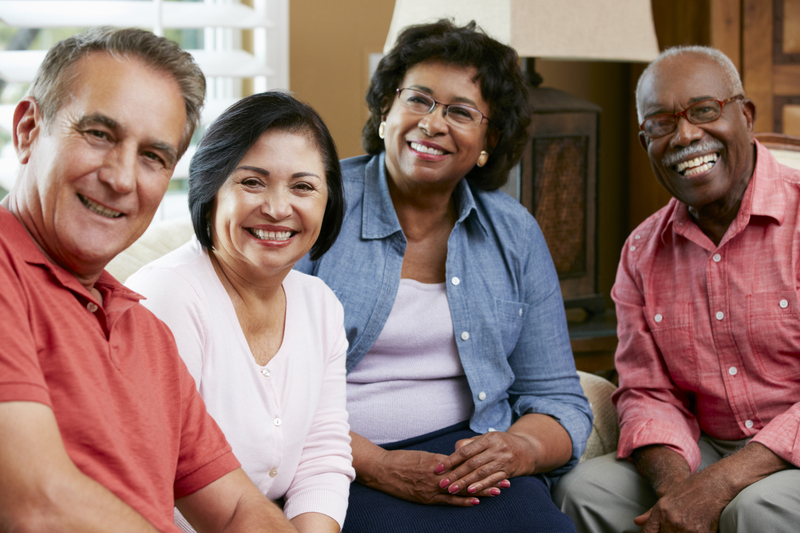 If your preference is to safely age in place in your home, you may want to learn more about private duty care, home healthcare services, and home modification services available in Washtenaw County. If you are just beginning your quest and have limited time, you may want to attend the Expo and gather all pertinent information available. The Expo, Health Screenings, Workshops, and Open Houses really do offer something for everyone. There is a lot to see and do so take advantage of this annual opportunity. Planning for retirement and long term care can be challenging but you don’t have to navigate it alone. Care Response Home Care has provided individualized private duty services and dementia care in and around Ann Arbor for more than 10 years. Owned and managed by Registered Nurses, we are proud to now offer certified Geriatric Care Management services. Our experienced nurses foster informed decision making by identifying risks and helping clients make smart home health care choices. 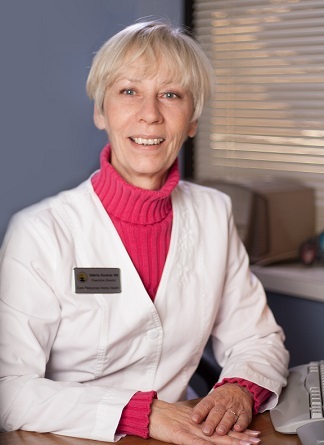 We strive to respectfully and compassionately meet the needs of our clients and their families, by listening, planning, educating and delivering the highest standard of individualized care. Our goal is to offer dependable client-centered home care services, one client and one family at a time. 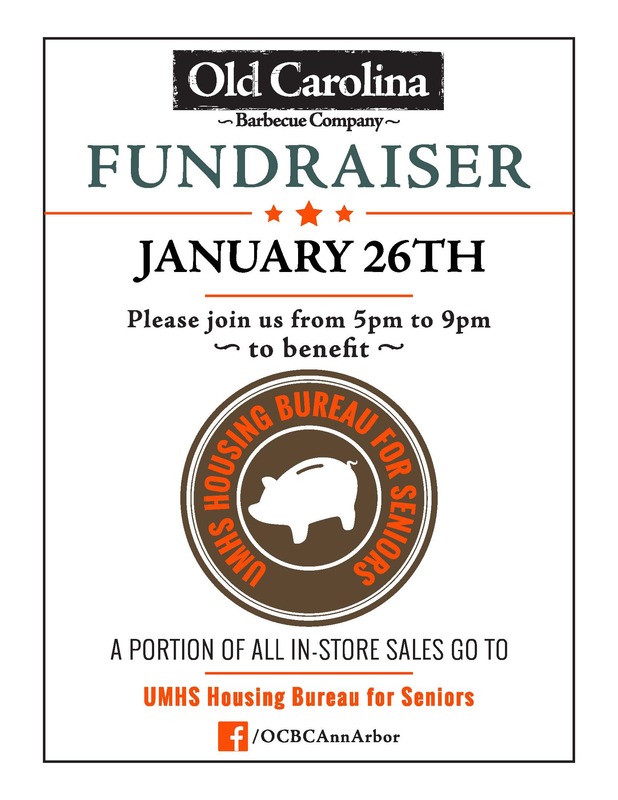 We want to thank the Housing Bureau for Seniors once again for the opportunity to serve our community and look forward to this promising event. We look forward to seeing you there!